Home > News > Come Meet Us at Microsoft Ignite! We are excited to be in Chicago for the show and can’t wait to see all of you. We’re talking about Skype for Business enabled meeting rooms, new features of our device selection portal, Device as a Service (DaaS), and more. Come say hello to Linda, Mark, Anaid and Ryan – they’d love to meet you! 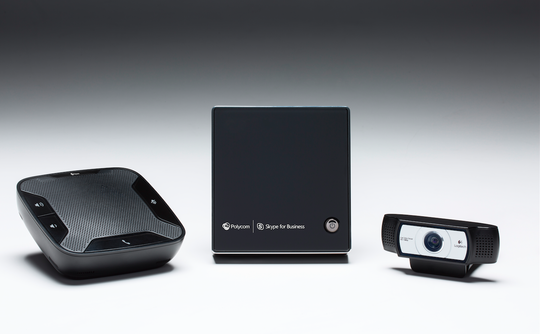 We’re giving away the NEW, soon-to-be-released Polycom RoundTable 100 Skype for Business video conferencing system! Click here for more information on how to enter. Good luck! Designed exclusively for small to medium sized business, the Polycom RoundTable 100 is an easy to set up and use, affordable meeting device that brings Microsoft Office 365’s Skype for Business to huddle rooms and small work spaces without the need for IT help.